I'm just back from the local where I've been proudly supporting National Cask Ale Week. I say supporting, really I've just been drinking good cask beer and talking about it to anyone that will listen. Still, if ever there was a reason to get out down the pub and try some good beer, Cask Ale Week is it! Living in Central London I'm in the enviable position of being able to call some fantastic pubs my "local". Tonight I went to the absolute local; a Wetherspoon's about two minutes walk away. Sounds terrible, but isn't. 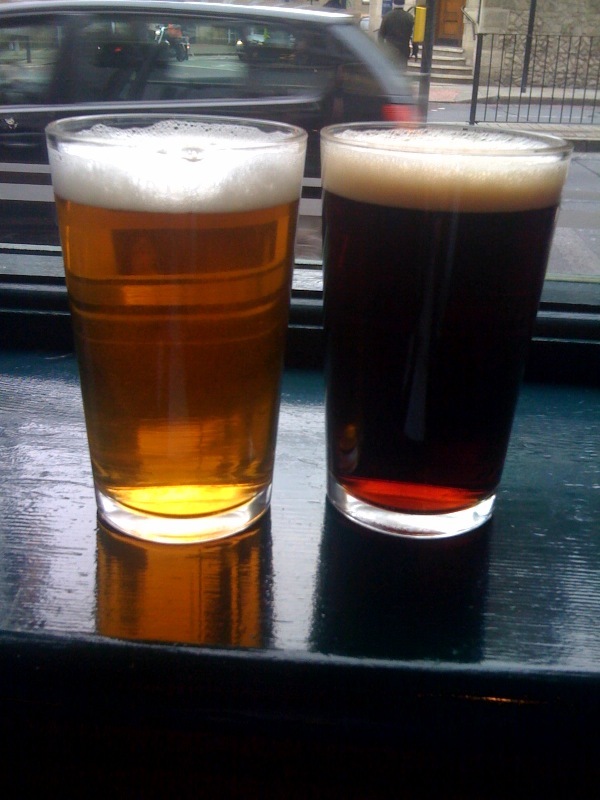 Love 'em or hate 'em, you can rely on the local 'spoons to always have a minimum of two guest ales on hand pull. These are almost always served in good nick and are very reasonably priced. Wetherspoon make decent cask ale accessible to main stream drinkers, and for that they should be applauded. With the idea behind Cask Ale Week being to champion and promote the wonder of Cask Ale, it seems fitting to me that I drink it in a Wetherspoon's pub. Tonight I had Sambrook's Wandle and Theakston Old Peculiar. 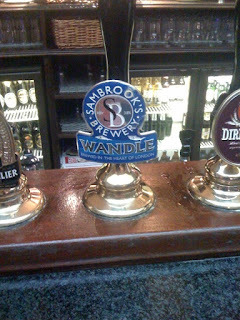 Sambrook's are a local brewery based in Battersea. 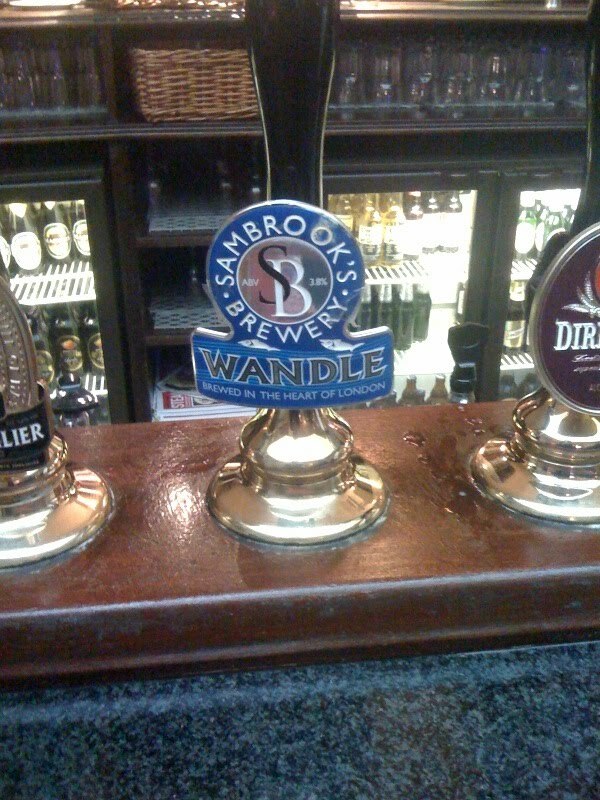 Wandle is their flagship beer; it's a beer I've had a few times now and it always takes me by surprise. It's billed as a thirst quenching English session bitter, but there's something unusual going on. It starts off with bready malt but that's quickly overtaken but something spicy and peppery; there's something estery about it and there are notes in there that seem characteristic of Belgian yeast being at work. The bitterness builds to a crisp finish, doing a good job of leaving you ready for the next mouthful. This is one of those beers I drink and spend the whole time trying to unravel, I'm not really sure if I like it or not. It definitely isn't what you expect it to be. Old Peculiar is a mahogany brown colour with hints of ruby around the edges. It's big and boozy, at times growing to become almost varnish like. Underneath that there's dark fruit: raisins, plums and ripe cherries. A vein of sweetness runs through the beer, leading to a subtle bitter finish. I only had the two halves but could've easily gone back for more. Good cask ale served in top condition is fantastic, almost irresistible in fact. Get out and drink some yourself!